The intensely vibrant Maltese boat bobbing upon the Mediterranean sea is the quintessential, quirky image of the island of Malta. The luzzu, pronounced ‘loot-su’, is a traditional Maltese fishing boat. This boat is as much of a national symbol as the Maltese Cross that adorns the national flag. 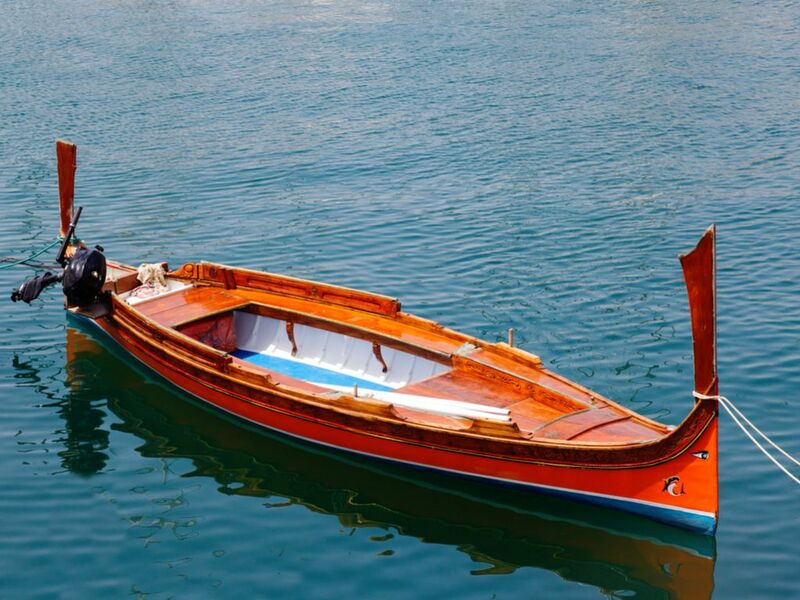 The double-ended, wooden luzzu boats are unmistakeable. Their vibrant hues of yellow, blue, red and green create a striking contrast with the deep blue waters. The colours pay tribute to the land, sea, sun and green fields of the islands. Colour combinations and hues may differ from one luzzu to another. When sons inherit luzzijiet (plural) from their fathers, they paint them in the same colours because of superstitious beliefs. For fishermen humbly facing the consistent danger of the unpredictable sea, there is much superstition surrounding the Maltese fishing boats. All luzzijiet bear the Eye of Osiris (also known as the Eye of Horus) painted or carved on the bow. It seems that the Phoenicians borrowed the symbol that represents protection, royal power and good health to protect this Maltese boat from danger. Of course, with ancient superstition comes a plethora of interpretations. According to one well-weathered fisherman, the eyes on the Maltese boat wards off the Great White sharks that lurk beneath the surface; the seductive eyes that unwaveringly stare back at the Great White will scare it away and keep the boat safe. More commonly, it simply wards off the ill-reputed Maltese evil eye cast by envious neighbours. Whichever legend you choose to believe, you’ll be hard pressed to find any fisherman who would dare not carve out the Eye of Osiris on their luzzu. Another distinctive feature is the band above the lower half of the boat, known as il-mustaċċ or moustache. Prior to the advent of boat registration, the colour of the ‘moustaches’ on the luzzu would indicate its home port. 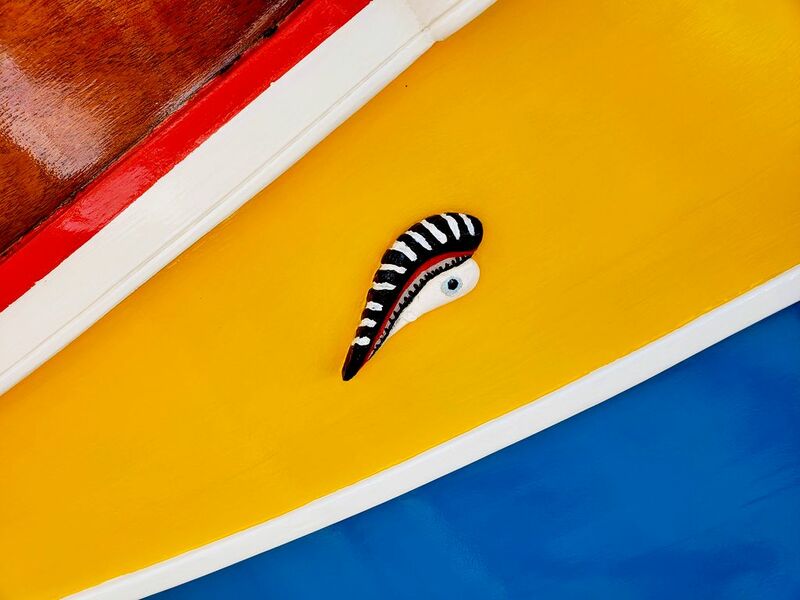 For example, a red moustache meant the boat was from St Paul’s bay, lemon from Msida or St Julian’s, and ochre yellow from the Marsaxlokk or Marsaskala area. 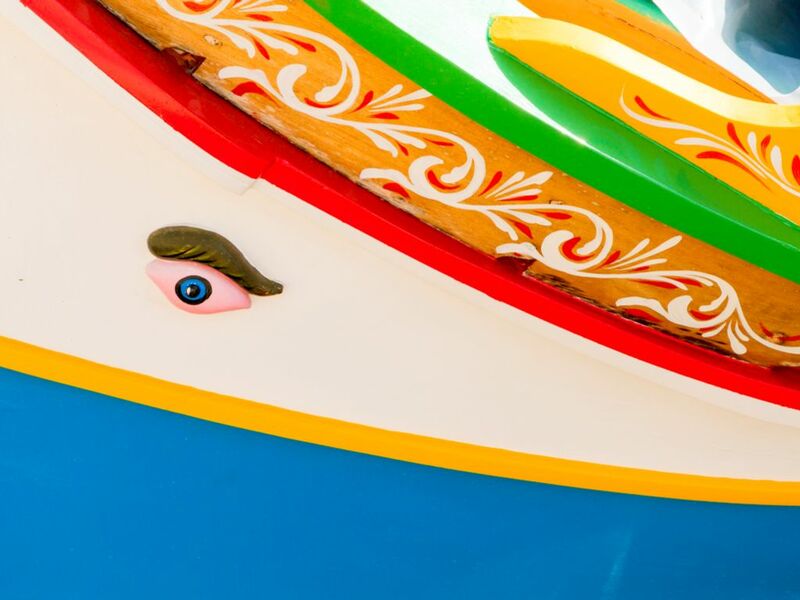 The vivacious looking Maltese boat, complete with eyes and moustache, seems to reflect the character of the people of Malta: jolly and inviting yet sturdy and reliable. The build and design of these sturdy wooden boats is said to date back hundreds of years, however the modern luzzu is larger than the original boats. This is largely because they no longer depend on oars or sails to move, but now run using diesel engines. 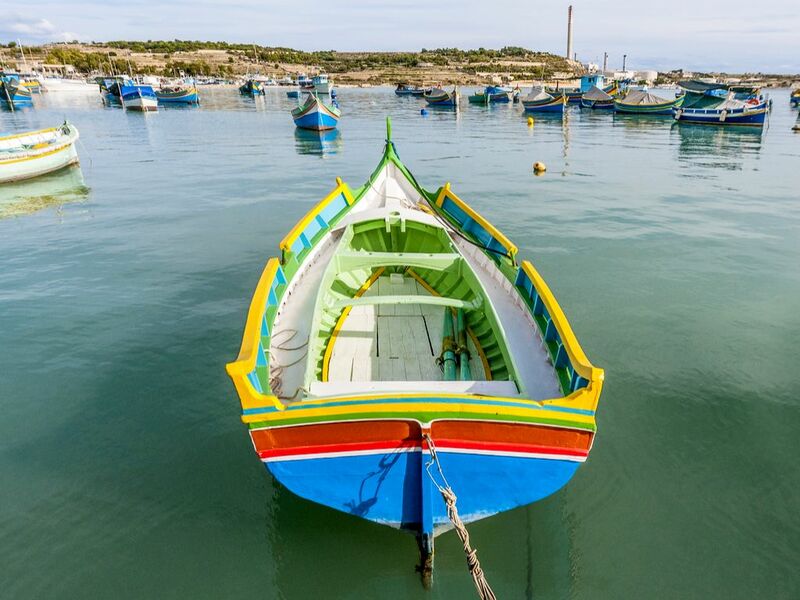 Also, the Maltese boat grew with the distance needed to travel to find a catch – nowadays, many Maltese fishermen must go far beyond local shores to fish. Maltese fishermen today still prefer the luzzu to modern fibreglass boats. Though the luzzu is an ancient looking sea craft that requires skill and precision to build and can be more expensive than a fibreglass boat, luzzijiet are more durable and stable even in bad weather. The Mediterranean Sea has always beckoned men to set sail and fish. Fishing in Malta is a long-standing trade. Customarily, the fishermen are out on the water before the crack of dawn, hunting for their daily catch to supply the fish markets. 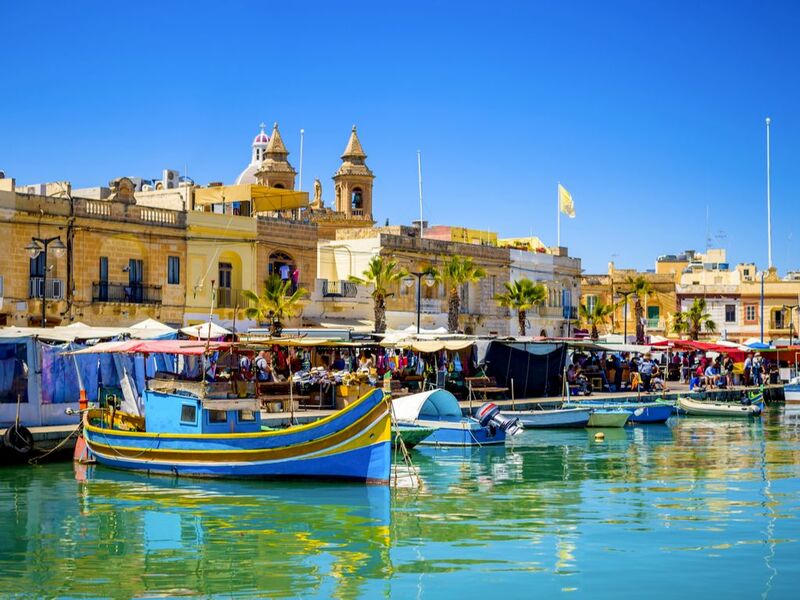 Local restaurants in Maltese seaside villages such as Marsaxlokk and Wied iz-Zurrieq obtain their delicious fresh fish daily from the fishermen, who rig their boats to the shoreline to sell their catch. The sight of the colourful luzzu boats as they enter the harbour, fishermen tossing fish, yelling to each other and trading their catch, transports you back in time, offering an enchanting, unforgettable experience. And you can rest assured that local restaurants serve the freshest, finest selection of fish and seafood. TIP: Try the ‘pesce al sale’ where some varieties of fish are covered in salt and foil and baked in the oven. The salt forms a hard shell that is fired and cracked open. Despite the intense salt crust, the fish does not taste too salty. And if you’re in Malta in September, try the lampuka or dolphin fish, which is a Maltese specialty. The luzzu is a signature feature of most Maltese villages around the island. You’ll certainly see them when visiting the fishing ports and harbours and dotted around the Gozitan shores. Go to Marsaxlokk, Marsaskala, Birzebbuga and Wied iz-Zurrieq. Though they are still used mainly as fishing boats by the locals, you can also find luzzijiet ferrying tourists around the Grand Harbour and other scenic sites. Although the luzzu is the most common traditional Maltese boat, it is not to be confused with the other similar types of Maltese boats that can be spotted around the islands. The kajjik , pronounced ‘kai-yik’, is a smaller version of the luzzu, with an average length of about 4.6 meters. Another difference is that the kajjik is flat at the stern, unlike the double-ended luzzu. It travels very slowly. Older versions of the kajjik were made of wood, however, many today are made of fibreglass. The kajjik seems to date back to the time of the Knights of St John, who governed Malta from 1530. During this time, the boats were armed with small guns and used to defend against enemies or used as lifeboats; nowadays, the kajjik dots fishing harbours and ports. The dghajsa, pronounced ‘dai-sa’, looks similar to a Venetian gondola. The most incredible spectacle of dghajjes (plural) is when these boats race against each other for the Malta Regatta. The biannual regattas commemorate the withdrawal of the British troops and Royal Navy from Malta and the retreat of the Ottomon invasion during the Great Siege of 1565. On a day-to-day basis, dghajjes would take passengers to and from larger boats berthed in the harbours. 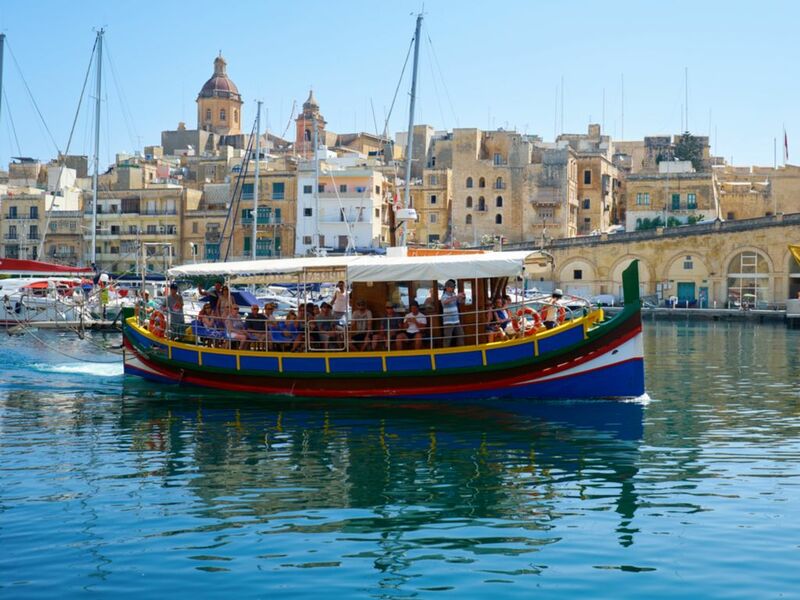 Today, you can hop onto a dghajsa for a trip around the Grand Harbour. The frejgatina, ponounced ‘frey-ga-tina’, is a small Maltese boat used for recreation or to ferry fishermen from shore to their vessels. The bow is short and this traditional Maltese boat is not as sea worthy as the luzzu or kajjik. There are few more authentic ways to experience Malta than by embarking on a luzzu for a boat trip. Aboard Malta’s most iconic boat, you’ll explore the nooks and crannies of the island’s rugged coast and the legacy of its rich history on the shore by sun-soaked seas. Dip into the turquoise crystal-clear waters, try snorkelling around the intriguing caves, bays and beaches and relish marine life in its natural habitat of crystal clear waters, which place the Maltese Islands on the list of top diving destinations. Alternatively, find a luzzu cruise that operates fishing trips and try deep sea fishing in Malta. Take a luzzu harbour cruise to enjoy the true splendour of the Grand Harbour and the majestic three cities Vittoriosa, Senglea and Cospicua. Absorb the riveting skyline of Valletta, declared a UNESCO World Heritage Site, from Marsamxett Harbour. Day excursions to the sister islands of Gozo and Comino are some of the most popular boat trips. Your boat trip can take you as far as Comino island with its caves and the spectacular Blue Lagoon. Or Gozo, where you can even disembark for a delectable meal and hop back onto your impeccably restored Maltese luzzu. 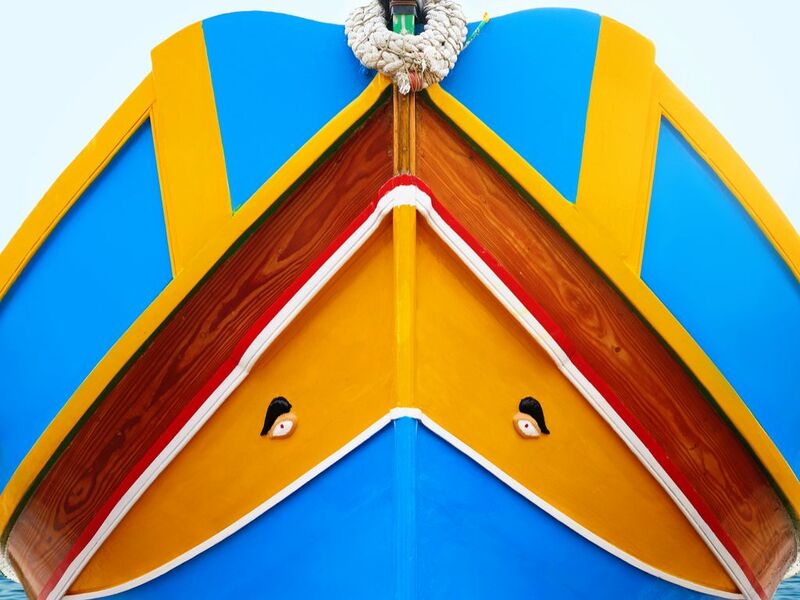 To photograph the Maltese fishing boat, steer your trip towards Marsaxlokk fishing village. 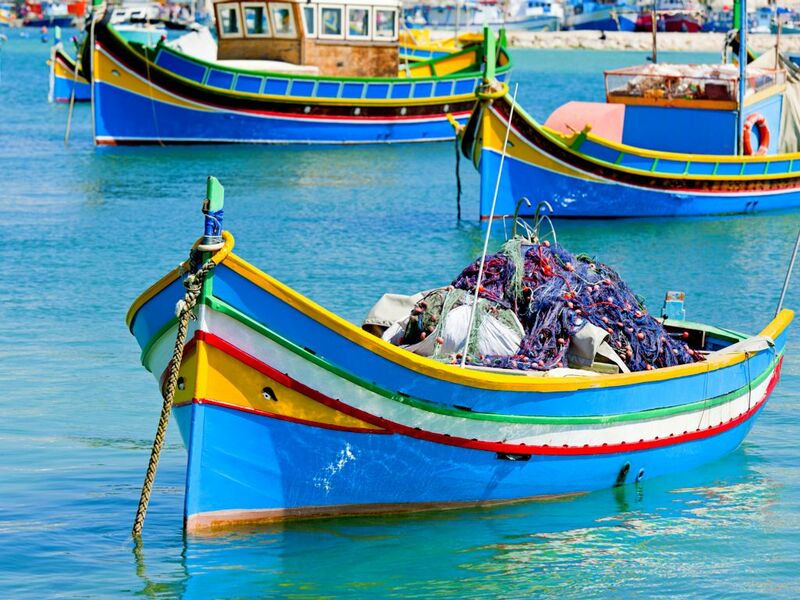 The fishing port is full of the colourful Maltese boat, while Marsaxlokk’s famous daily market reaches huge proportions on a Sunday. 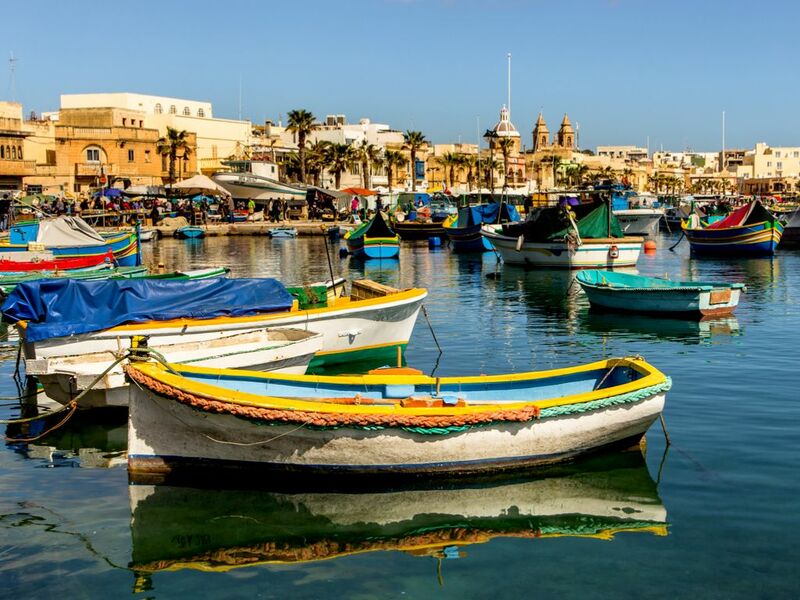 The Marsaxlokk fish market is infamous for being one of the most vivacious experiences of traditional Maltese culture. The seafront comes alive with market stalls selling an array of fresh Mediterranean seafood and local produce, such as honey. In addition, you’ll find all sorts of local handicrafts such as the intricate Gozitan bizzilla (lace), souvenirs and much more. 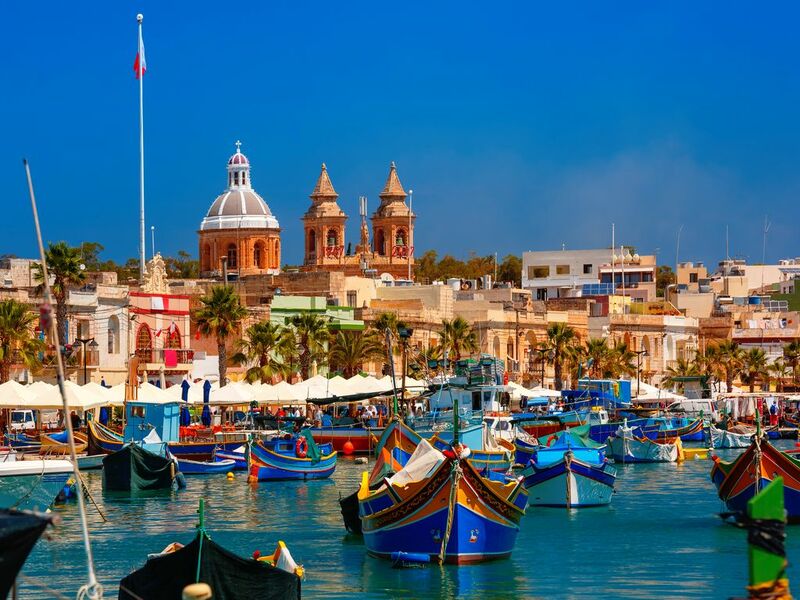 In addition, Marsaxlokk boasts a seafront dotted with several restaurants serving freshly caught fish and other delicacies of the Mediterranean cuisine. Definitely one of the best things to do in Malta, experience the luzzu as part of your authentic Maltese experience. I agree to receive future communication from Azure Services Ltd.